The crew of Soyuz MS-08 spacecraft took this image of the International Space Station in October 2018. 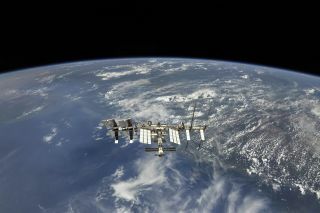 Russian space agency Roscosmos released the photo to celebrate the space station's 20th anniversary. For two minutes, NASA astronaut Leroy Chiao could see nothing but blue-marbled Earth swirling above his head. "Surreal" is how he described the moment. Chiao was in the middle of a lengthy spacewalk to assemble part of the International Space Station, an orbiting laboratory the likes of which had never been seen before. Today (Nov. 20) marks the 20th anniversary of the launch of the station's first component, made possible by the contribution of hundreds of engineers, space shuttle astronauts like Chiao, international support and the crews who continue launching up to this day. It has been continuously occupied since Nov. 2, 2000. The International Space Station, or ISS, pushed NASA into "an entirely new way of thinking," Gary Oleson, a station engineer, told Space.com. Oleson worked as a member of NASA's Space Station Program Office from 1988 to 1993; at first doing the cost side of systems engineering, and then as a principal systems engineer liaison, where he focused on the project's logistics and maintenance. "We normally think of a spacecraft as being a spacecraft," Oleson said. "But it turned out that the International Space Station, during the assembly, was not, from an engineering point of view, one spacecraft. It was at one time 19 different spacecraft, because every time you went up and added a new element, you had a different spacecraft. It had a different mass; it had a different reliability." Astronaut Leroy Chiao, Expedition 10 commander and NASA ISS science officer, participates in the first of two extravehicular activities (EVA) performed by the crew of Expedition 10 during their 6-month mission from Oct. 2004 to Apr. 2005. The ISS includes contributions from 15 nations. The space lab's major partners include NASA, Russian space agency Roscosmos and the European Space Agency; the Japan Aerospace Exploration Agency and the Canadian Space Agency are also partners. Since the space station opened, the ISS has hosted 232 individuals from 18 countries. The space lab flies at an average altitude of 248 miles (400 kilometers) above Earth's surface. It circles the planet every 90 minutes at a speed of about 17,500 mph (28,000 km/h). To put that in perspective, the distance the ISS travels daily is roughly how far it would take to go from Earth to the moon and back. Current plans call for space station operations to continue through 2024. The Trump administration has proposed to no longer directly support the space station after 2025. Chiao said he's disappointed in the plan to discontinue the space station after 2024 or 2025. "This whole idea of commercializing it… the space station was never designed or intended to be profitable," he said. "Just to pay for that infrastructure, it's unreasonable. And launch costs. How are you going to cover launch costs for research and astronauts to and from the space station commercially? It just doesn't make any sense. If we keep going down this path, the space station will end." The argument to end the station's public-service career early is that saving on the costs of the space station means funding more human space exploration like a return to the Moon and an extension to Mars. "I think the lunar base makes sense for a lot of reasons," Chiao said. "You want to be able to go, reestablish your environment and make sure it's going to work before you send it off to Mars." But, he added, "saving in one area doesn't mean funds are going to be available for the program you want… that's not necessarily true." While the future of the space station remains uncertain, the perspective it affords to anyone looking at images taken from its cupula is most definitely awe-inspiring. "The fact that we do have a vehicle in space — the ISS — and the fact that we do launch regularly to it, serves as an inspiration to young people," Chiao added. Stories like his breathtaking two minutes gazing at the continents and clouds moving across the blue planet are certainly enough to mesmerize anyone. Follow Doris Elin Salazar on Twitter@salazar_elin. Follow us @Spacedotcom and Facebook. Original article on Space.com.